Jackie Bradley, Jr. finished a single short of the cycle, going 3 for 6 with two runs scored and 4 RBI. Jonathan Diaz and Ronald Bermudez each added three hits, and Xander Bogaerts went 1 for 5 with a double. 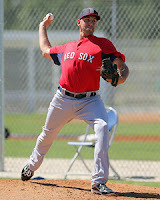 Will Middlebrooks went 0 for 5, and Kiley McDaniel of FoxSports.com tweeted that he looked even worse than his line. Matt Barnes turned in his best start of the season, leading the Sea Dogs to a 5-1 victory over the Reading Fightin Phils (PHI). Barnes struck out 10 over seven shutout innings, allowing only three hits, while walking three. The seven innings tied a career high, while the 10 strikeouts were his most since May 1, when he struck out 10 in six innings against the Fightin Phils. Barnes has now struck out 98 batters in 79 1/3 innings this season, an impressive number even though his ERA (4.75) is still high. There is more on Barnes at the end of the article. Derrik Gibson reached base three times, and his sixth-inning solo home run broke a scoreless tie. Peter Hissey went 2 for 4 with two stolen bases, and Garin Cecchini went 1 for 4 with a double. Salem played arguably its best game of the season, beating the Frederick Keys (BAL), 9-0. Salem set the tone in the second, scoring four runs on five hits, with Stefan Welch launching a home run and Blake Swihart adding a double. In the fifth, Henry Ramos hit a two-run home run, Swihart added an RBI single, and Mookie Betts hit a run-scoring single. Betts capped the scoring with a solo home run in the eighth, his first for Salem. That was more than enough offense for Heri Quevedo, who allowed only one hit in five innings, striking out six. Nate Striz and Mathew Price allowed only one hit in the final four innings, giving Salem a two-hit shutout. Facing a tough opposing pitcher, the Drive managed only three hits, as they were beat by the Lexington Legends (KC), 4-1. Going against Miguel Almonte, who was making his first start since appearing in the Futures Game, the Drive managed to get only one unearned run while striking out 14 times, 10 of which came against Almonte. His performance overshadowed the work of Francellis Montas, who threw seven strong innings, allowing only two runs and no walks, while striking out five. Mario Martinez went 1 for 3 with a walk and drove in the only run for Greenville. It was a short but sweet start for Ty Buttrey, as he led the Spinners to a 6-2 win over the Williamsport Crosscutters (PHI). Buttrey went the first four innings, allowing one run on six hits, while walking one and striking out four. After a rough first start, Buttrey has allowed only three runs in his last 25 2/3 innings, lowering his ERA to 2.22 in the process. Kyle Martin and Joe Gunkel combined for three perfect innings in relief, with Martin lowering his ERA to 0.56 and Gunkel keeping his at 0.00. The top of the order did most of the damage for the Spinners, as leadoff man Forrestt Allday and two-hole hitter Tzu-Wei Lin each reached base four times, stole a base, and scored two runs apiece. Allday went 1 for 2 with three walks, and Lin went 2 for 3 with a double and two walks. The GCL Red Sox scored the winning run on a balk, beating the GCL Twins (MIN), 3-2 in 10 innings. The Red Sox scored runs in interesting ways on Saturday, as they got on the board in the first when Jesus Loya stole home as part of a double steal with Wendell Rijo. They used a more traditional method in the fifth, when Rijo doubled home Raymel Flores to tie the game at two. The score remained tied until the tenth, when the Twins pitcher balked with runners on second and third to bring the go-ahead run home. Ellis Jimenez pitched a scoreless bottom of the inning to pick up the save. Randy Perez allowed one earned run in five innings, and he has been solid in his first few stateside appearances. Player of the Day: Matt Barnes struck out 10 in a dominant seven-inning performance, which should help give the right-hander confidence to get through the dog days of summer. While Barnes had been struggling entering the start, you have to wonder if he was a bit unlucky. His 11.36 K/9 is one of the best in the system, and his 3.59 BB/9 is below the Eastern League average of 4.02. The big difference in his numbers is a .375 BABIP, which has led to him allowing more than a hit per inning for the Sea Dogs. While this number is not entirely driven by luck, it makes one think that if this number does regress towards the league average a bit, Barnes could go on a roll to end the season. When Barnes talked to SoxProspects.com Senior Columnist Jon Meoli in June he said, "Numbers are very misleading unless you see somebody pitch; unless you watch them perform you really don't know anything...The numbers aren't the best, but I feel great, I'm stringing a couple good ones, decent ones together and going from there." It would appear that Barnes knows he is pitching better than his stat line, so starts like Saturday's go a long way towards reinforcing that point.